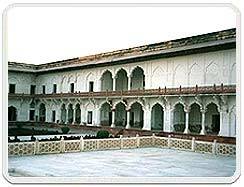 Built by Raja Bir Singh Ju Deo in the 17 th century. Its strong lines are counterbalanced by delicate chhatris and trellis work, the whole conveying an effect of extraordinary richness. The palace is five-storied and houses as many as eight pavilions. The third floor has a court where the ruler of Orchha met with their subjects.The court is raised over superimposed arcades with a wide gallery overlooking it. A long line of elephant brackets flanks the entrance to the monument, and a reddish-brown cornice runs along the periphery of the court. The fa�ade of the Jahangir Mahal is decorated with a plethora of geometric patterns, and paintings of peacocks and flowers. 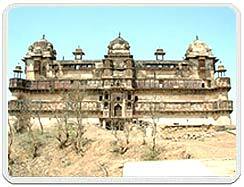 As the very name of the monument suggests, it was built in honour of the Mughal Emperor Jahangir, by the Orchha ruler, Vir Singh. The friendship between the two went back a long way, much before either of them became monarchs.Before he became Maharaja, Vir Singh owned the fief of Badoni, situated midway between Orchha and Gwalior. Meanwhile, in the Mughal Court, the relationship between Emperor Akbar and his eldest son, Salim (later to be known as Jahangir), was always a tempestuous one. Prince Salim was a bit too susceptible to affairs of the heart, and his dalliance with Anarkali had riled the emperor no end.Abul Fazl, one of the Navratnas, or Nine Jewels, in Akbar's court thrived on the rift and persuaded Akbar to forfeit Salim's heirship to the Mughal throne. Inevitably, Salim revolted against this, and Akbar deputed none other than the Machiavellian Abul Fazl to quell the rebellion.Fazl began a march to Agra to meet Salim's army in battle, but first he had to travel through Badoni, which was en route. At this crucial juncture, Vir Singh decided to help his friend Salim in his hour of trial by attacking Fazl's army and vanquishing it. Not content with that, he chopped off Fazl's head and presented it to Salim. This was in 1602, and three years later when Akbar died and Jahangir replaced him as the emperor, it was time for him to repay the favour to his old friend.Accordingly, he bestowed the whole of Bundelkhand to Vir Singh and even attended his coronation in 1606. 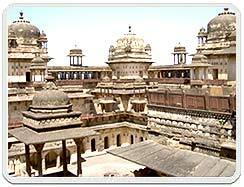 It was on this occasion that Vir had the Jahangir Mahal built to receive Emperor Jahangir when he visited Orchha. 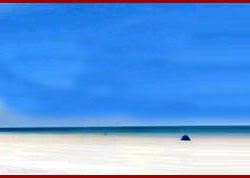 The palace today stands as a memorial to the great friendship between the two erstwhile rulers.